There are times in life where every single thing that could possibly go right- do. I follow quite a few people on Instagram. A LOT of fellow bakers, a few fellow bloggers, some "real life" friends, and then lastly people whose pictures I'm just drawn to. It's rare that I do the latter- but in some cases, people's pictures are just so beautiful- their stories just so intriguing that I cannot NOT follow them. It's mostly a fun journey to be a part of. This is a story of that latter person- a mama who followed me way back, who-knows-when, and whose pictures and story were so incredibly inspiring and encouraging that I just couldn't leave her be. So I followed back. Upon following her, one immediately learns about certain storms she's faced in her life and how she courageously pushed through them. Remarkable trials! With each beautiful picture she decides to share, she includes more snippits of her life, a paragraph at a time, and allows each one of us to become a part of it. One also learns even quicker, about a little girl who has become a big part of her life- her daughter Sammy Lu. Born with a mild form of autism, both Sammy and her mama live life as though there's nothing stopping them. The pictures Sue captures of Sammy are incredible. Absolutely amazing. So here's where I come in. Over the last year or so, much to my delight, Sue and I have become sort of friends via Instagram. She likes and comments on the things that I find amazing, capture, and share...and I, her. There have been prayer requests and there have been joyous times. There have been trials and errors...as well as victories. 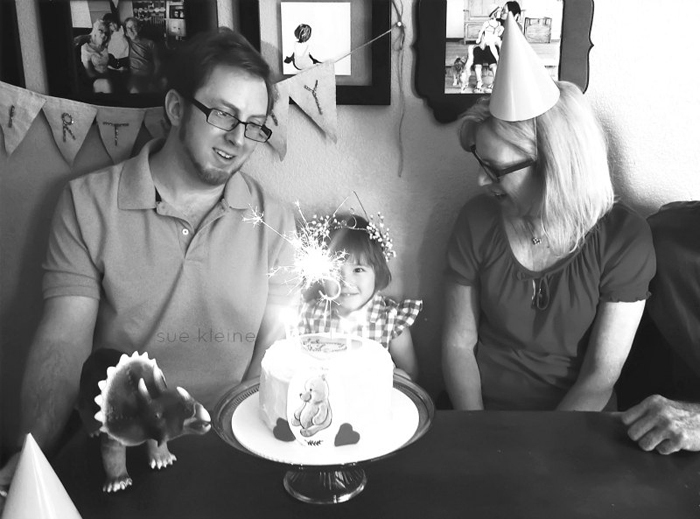 A few months back, Sue started planning her little Sammy's 5th birthday. I'm not going to lie- there was a little part of me that was hoping she would think of me for something (anything) to make for the cake. She did. I received an email via Etsy which was filled with love and praises as well as a request for me to construct some sort of edible cake topper for this little one's upcoming big day. 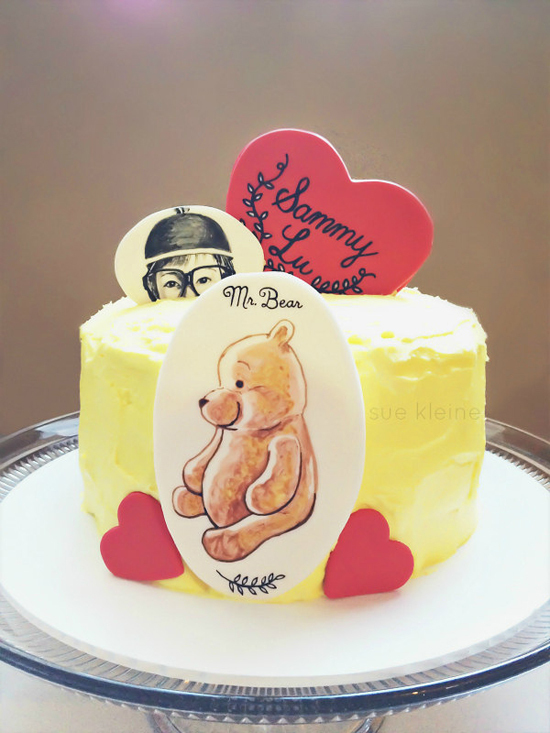 A 5" Custom Edible Hand Painted Cake Topper is available for purchase. One of the things that HAD to be included (and anyone who follows Sue totally knows about) was Sammy's ALL TIME favorite toy- Mr. Bear. I would say it is safe to estimate that 80% of the Sammy pictures include her doing something with this guy. 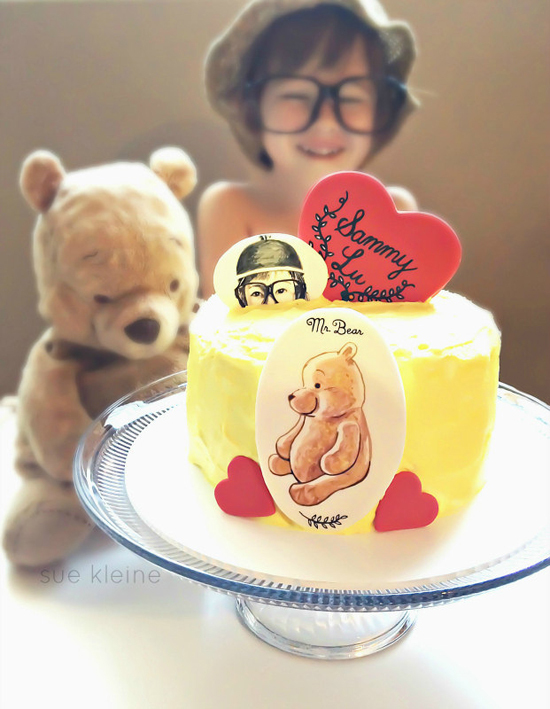 From tea parties to snuggles in bed- Mr. Bear is there. It's too precious. So we cut out a 5" edible cake topper out of gum paste and hand painted the big guy with edible paints. Then we hand scripted his name and added little details; in no time I was in love. 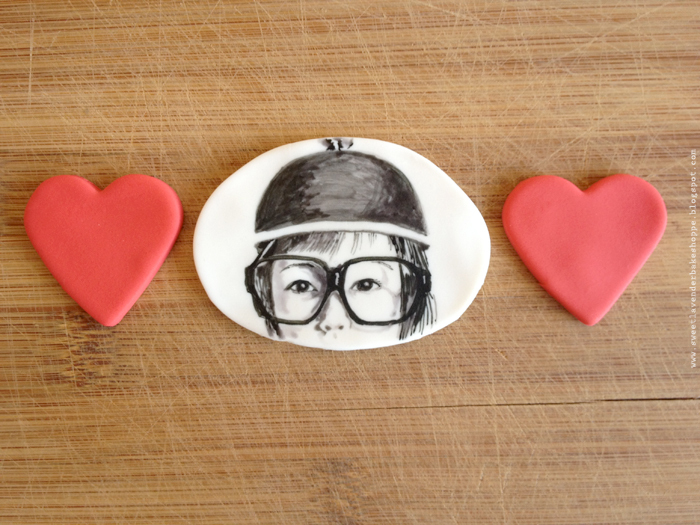 A custom 4" Hand Painted Edible Cake Topper is available on our Etsy. Secondly, we decided the star of the big day had to be included as well. I searched through Sue's Instagram pictures and found one of my favorites- a little peeking Sammy wearing a cute little hat and giant geeky glasses. 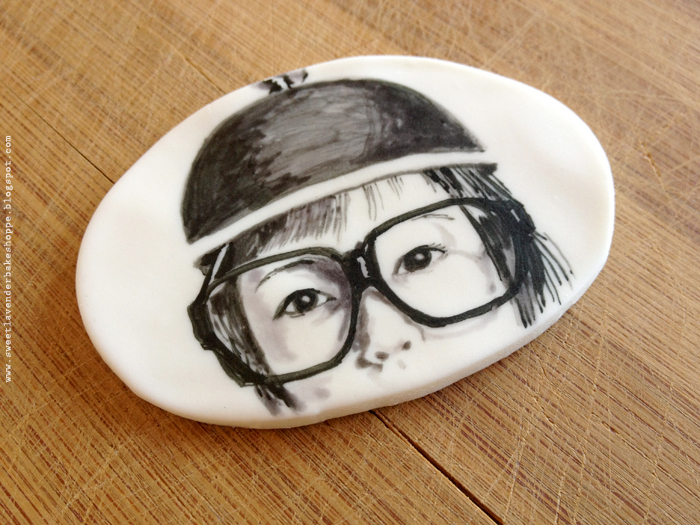 So again, we hand cut a 4" oval out of gum paste and hand painted her sweet face using edible paints. 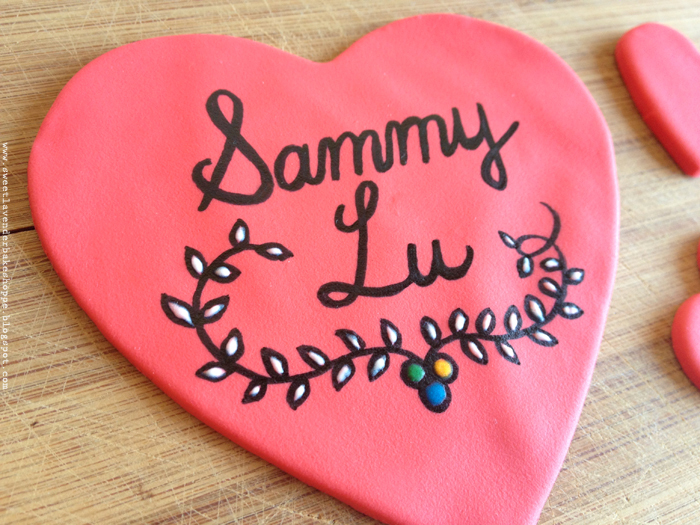 We colored and hand cut out a 5" heart, and hand scripted Sammy's darling name across it. 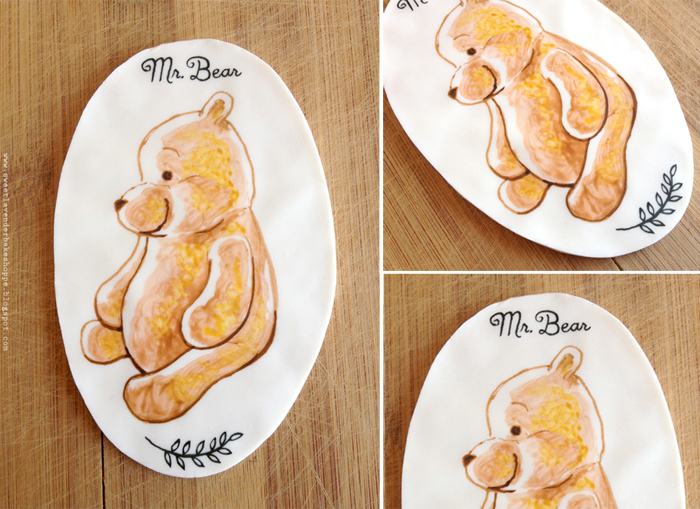 Tying in the details of Mr. Bear, we also hand painted more of the vine-like designs. 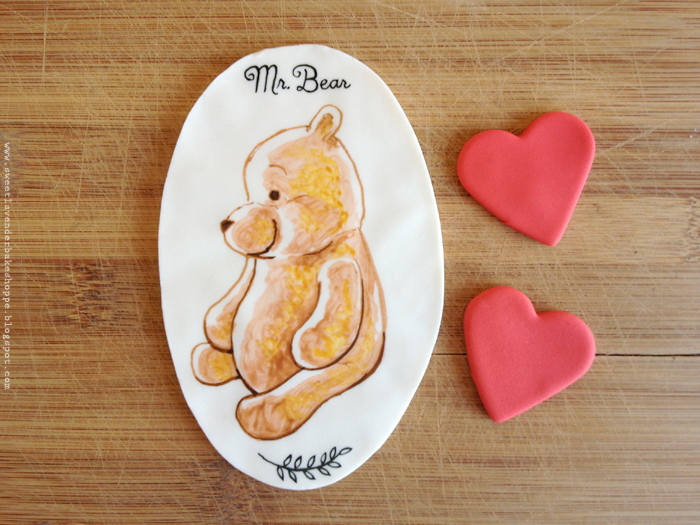 A 5" Custom Hand Painted Edible Heart Shaped Cake Topper is available to purchase. After all was said and done I looked at our creations and giggled with delight. This is BY FAR my favorite order, yet. I could not wait to send them off to Sue! I could not wait to see her pictures of them and hoped hoped hoped she'd be kind enough to share with me! And a very big thank you to Sue Kleine for befriending me, loving what I do- and choosing me to make Sammy's big day a sweet success! Oh goodness, makes my heart melt! Thank you my lovely and talented friend for creating edible cake decorations that made my lil' girl's birthday extra special! Also, thank you to your fantastic husband and his legit art skills!!! Oh man! CANNOT WAIT! This was by far the most fun!